It takes a lot for me to substitute out a holy grail product. As you may or may not know, I've used the Covergirl Outlast Stay Fabulous foundation religiously since my freshmen year of college. That's over three years of consistent every day wear. It took me ages to find a foundation that I loved and I really dedicated myself to it and stuck with it. The fact that I even looked at a new foundation, let alone used it daily is a huge deal, in my opinion. I've been curious about NARS foundations for a while and I figured it was time to give their face products a try after being obsessed with their lip and cheek products (the eyeshadows I've used are great too) for ages. I bought my foundation in the shade Mont Blanc (Light 2). To find my perfect shade without getting matched in the store (because I'm lazy), I used the Foundation Matrix from Temptalia to cross match with both my MAC shade (NC20) and the color of my Urban Decay Naked Skin Concealer. I'm using Fair Neutral right now, but I've used Light Warm in the past too. Also, for color matching purposes if you have a similar skin tone (aka fair AF), I've used NARS Radiant Creamy Concealer in Custard and Cannelle in the past. Color aside, I do like the foundation. I do! I'm glad I stepped out of my comfort zone and got a new foundation. It's oil-free and it feels incredibly lightweight. Still, it covers the redness in my face incredibly well and with much less product than I needed with my Covergirl foundation, though they are two totally different consistencies. 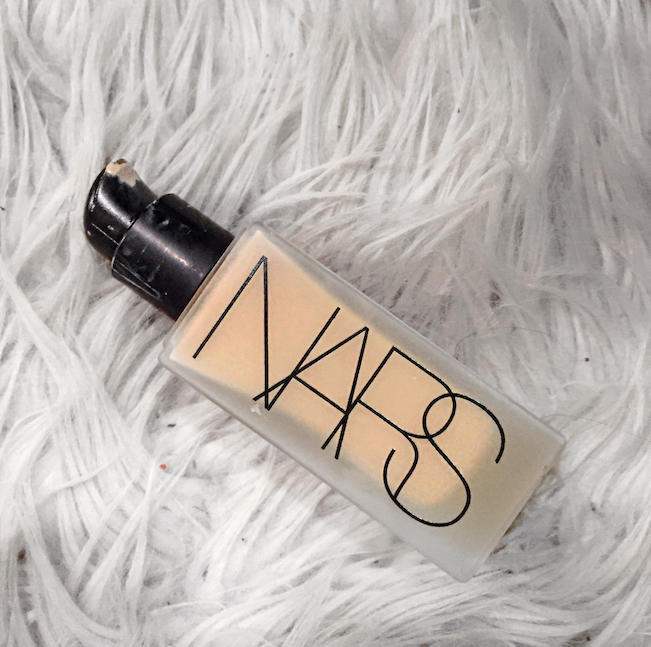 The NARS foundation is very liquidy, but it's also inanely pigmented. It leaves a really natural finish and doesn't completely mattify your face and cling to every little dry patch. My one and only gripe is that it wears off in certain areas, typically around the chin and nose. Now, this could easily just be me and my skin or my setting powders. It doesn't happen every time and generally it takes many, many hours of wearing it to show off any sort of separating. So for long, grueling days where you need to consistently look good? Maybe bring something for touch-ups. Do I still love the foundation? Of course! I think the initial semi-dewy and not completely matte finish is incredible (especially with Hourglass Ambient Lighting Palette to set it). It just gets tricky as the day goes on, but that's nothing a good primer and touch up can't fix! You may or may not have heard the really tragic news about Louis Tomlinson's mom. Last week, she passed away from a very aggressive form of leukemia. Whether the song was previously written in her honor or not, it released a couple of days later when Louis performed the song on The X-Factor alongside Steve Aoki as it was his mom's dream for him. I'll be honest, I've only briefly heard of Steve Aoki before this song and I'm not exactly the biggest fan of EDM, but I think the song is fun and has an amazing message. I've really been enjoying listening to it in the car and having mini dance party sessions. I think they've done a great job and I'm really, really excited to see what else Louis releases, especially since he did a lot of the writing for One Direction songs in the past. If you're interested, you can stream the song on Spotify or purchase on iTunes. No, I'm not participating in Vlogmas, unless that includes binge watching everyone's Vlogmas series. I used to hate watching vlogs, but now they're the only thing I want to watch. Seriously, I'll sit down and watch three of Zoe Sugg's vlogs in a row (all around 20-30 minutes...that's a whole episode!) and want more. It's like watching reality TV without all of the drama. It's honest to god just reality TV in its truest form, not how we know it today. I find them very relatable and I just enjoy the more toned down style. My favorites this season have definitely been Zoe Sugg, Jack Maynard, Lydia Elise Millen and Tamara Kalinic. I watch Caitlin Bea's from time to time, as well as Vlogmas videos from Lily Pebbles and Tanya Burr. I cannot show a picture of this because mine is so gross already and cake in foundation and concealer, but you're not missing much. It's just an orange, dome shaped sponge with a pointed tip and one flat side. I mainly only use this for my undereye and regular concealer. I prefer applying my foundation with a brush, but I've been using throw away complexion wedge sponges for my concealer lately and I just figured it was time to replace them with an actual makeup sponge. I can't compare this to the Beauty Blender as I've never used it, but I think for $7, you can't go wrong with this to just try out a makeup sponge.